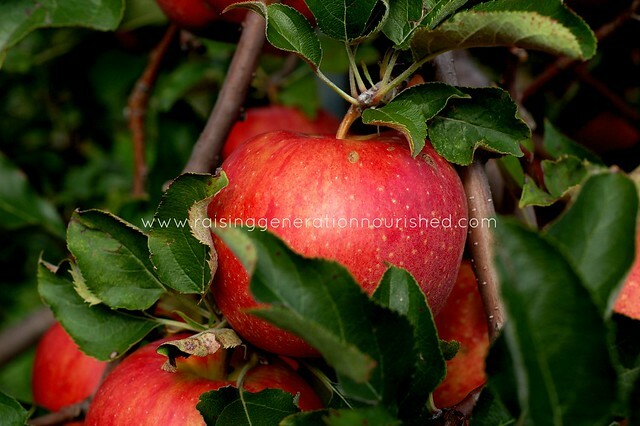 I am a big time summer girl, and about the only thing that makes the transition to cooler weather ok for me is the promise if an amazing apple harvest where we live. 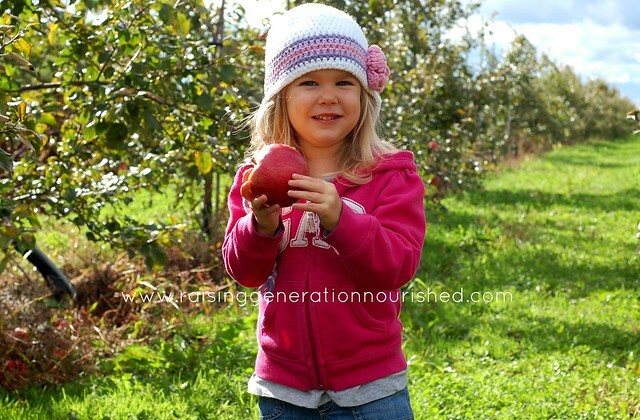 We visited the apple orchard by our home this weekend, and while the weather felt more like November, the girls had a great time, and the apples were gorgeous. We are literally surrounded by orchards. We used grandpa’s apples for applesauce a couple weeks ago, and the rest of our apple haul will come from an orchard by our home. 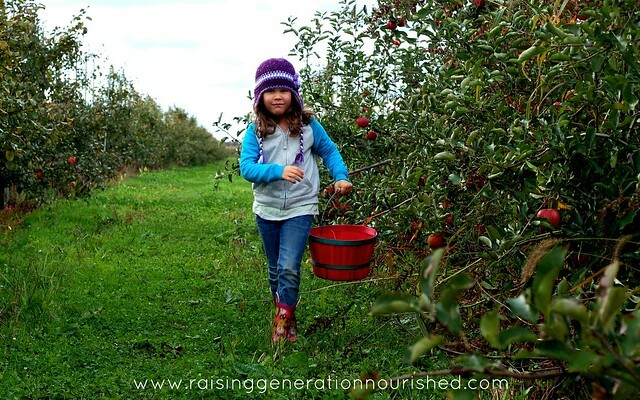 I just love supporting this sweet local family and pick on their farm. 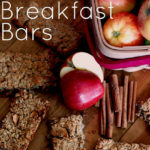 I double batched these great apple breakfast bars to make life a little easier on school mornings – and I will probably pack them in Chloe’s lunchbox here and there this fall! The recipe goes super fast – very do-able! 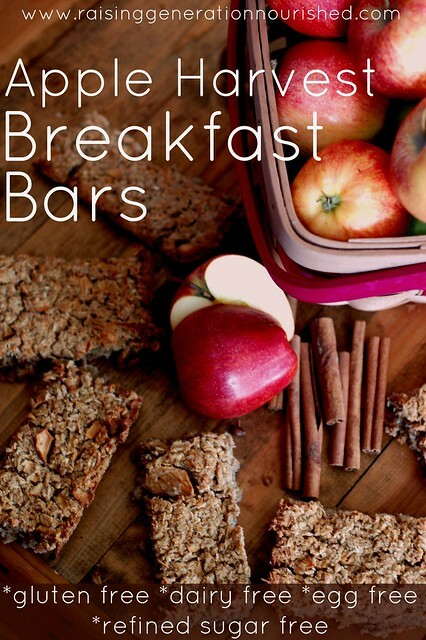 Apples for breakfast - in these bars your kids might think it's dessert, but you'll know it's a nourishing meal. 4 cups oats Not quick oats. If you are gluten free be sure the oats say gluten free. The night before you want to make the bars, get the oats and lemon juice into a large mixing bowl. Fill it up with water to cover the oats – enough that can you stir it and the oats are submerged. Set the bowl under the light in your oven or a warm spot in your kitchen over night – this soaking process makes the oats easier on your gut to digest. The next morning, get the rest of your ingredients into the mixing bowl with the soaked oats and stir to combine. Spread the batter on to a silpat lined or buttered large jelly roll pan, and cut into the size bars you want. Bake at 375 for 1 hour and 15 minutes. Cool before serving. This batch makes about 16 bars depending on how big you cut hem. You can freeze leftovers and/or send them along to school as a lunchbox addition. Get the dry ingredients together the night before so you just have to dump them in with the soaked oats in the morning. I love my Silpat pan liners – it makes clean up so quick and easy! Here is the coconut flour I like to use – it isn’t clumpy and it measures consistently. I get coconut shreds in bulk at our local health food store but THESE work well if that is not an option. I like getting these bags of almond flour – it doesn’t clump and measures well. I get large containers of non-GMO oats at our local store, but these are great gluten free oats if you don’t have access near you. 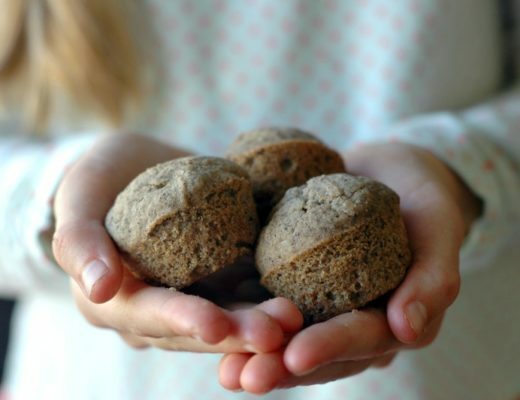 If you are nut free, try subbing the 1 cup of almond flour with 1/2 cup brown rice flour (or sorghum flour) AND 1/2 cup of tapioca flour. This post was shared at Fat Tuesday, Real Food Wednesday, & Traditional Tuesday! I can’t wait to try these…and because I”m nuts, I may go soak some oats right now!! And THAT, my friend is why we get along so well. I would totally do the same thing 🙂 Hope you guys love them! I bet my kids would love these! I’d just have to figure out a sub for the almond flour. Maybe I could use some tapioca combined with something else. I’ll have to give it a try. I’m new to soaking oats. Do I drain the water before mixing the other ingredients? If not, how much water do I use for soaking, as that will make a huge difference in consistency, I think. Thanks! I made these this morning and they are delicious! What is the consistency of the bars supposed to be like? Thanks! Hi Melissa! Glad you liked them! 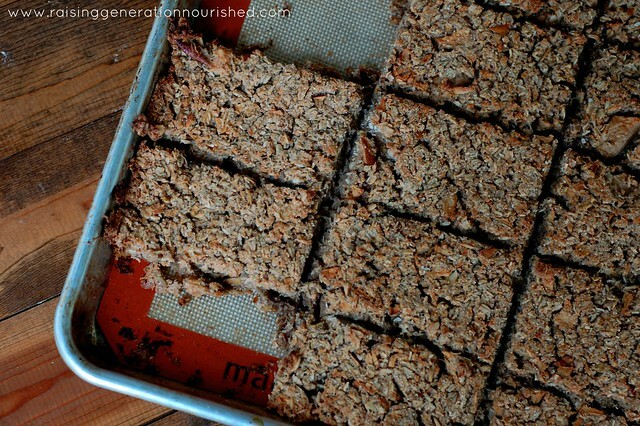 I would say like a granola bar – if you want it crisper you can bake them longer, if you want them more cake like you can bake them in more like a 9×13 inch pan so they are thicker. 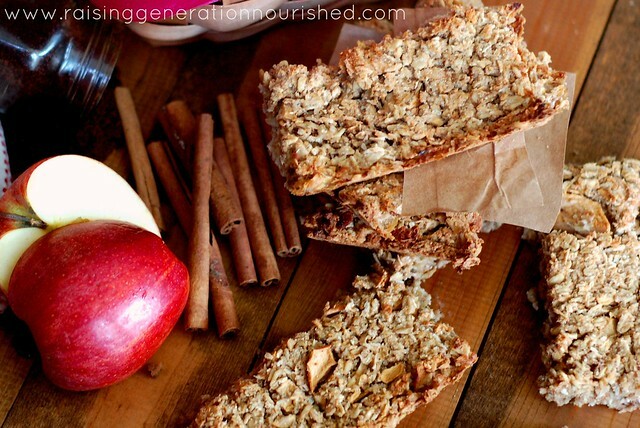 These look delicious, perfect for a healthy breakfast on the go. I just used up all of my apples to make apple sauce. Do you think I could use apple sauce in place of the chopped apples? If so, I have all of the ingredients on hand! Hi Beth! Yes you could! Play around with the amount a little bit since the applesauce will be more “wet” than the chopped apples – start out small and you can always add more. The batter should feel like granola mixture – not runny, and thick but not dry. If you feel like it gets to wet you can add more flour. The recipe is pretty forgiving – you can bake it off shorter or longer depending on the batter consistency. Let me know how they turn out for you! Okay. It just went into the oven. I soaked the oats all day. Will let you know how it turns out! I think I might have added too much water to the oats so I added a little more flour. 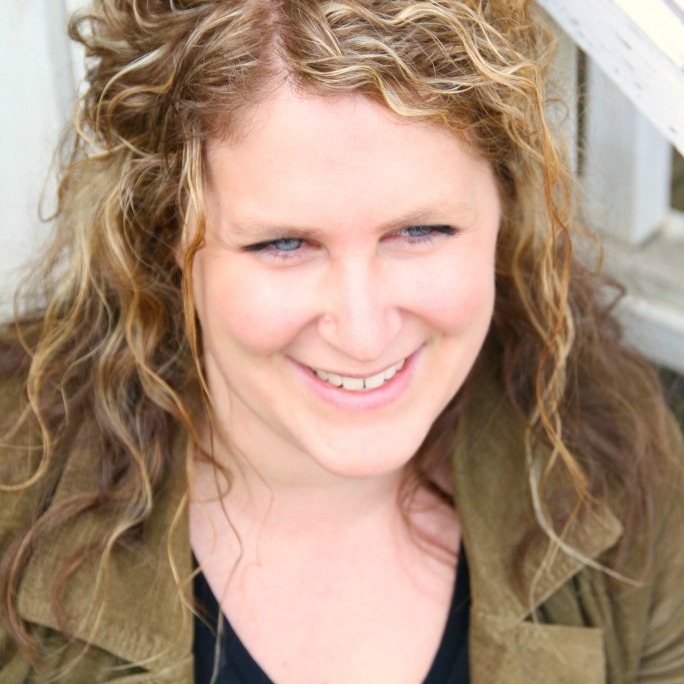 I just discovered your blog and have enjoyed seeing your recipes. This is my first try at one! Do you soak your oats when you make granola too? I am been avoiding granola bc it feels hard to digest sometimes but wonder if soaking it would help. Great Beth! 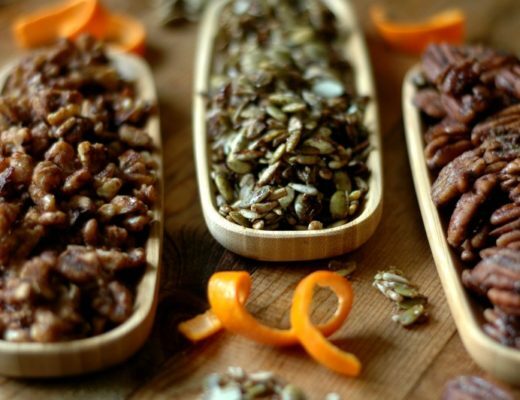 And YES same process for making granola – and I bet your tummy will feel much better too! Are these a chewier or crunchier bar? Looking to make these for a quick breakfast during spring sports season coming up and want to know if my 18 month old will be okay eating them. Do you cut them before you bake them? I’m just wondering because I already tried out quite a few different recipes and they all suggested baking first, then cutting once the bars are cooled. That way they are supposed to not fall apart. Hi Birthe! I run my butter knife down them before I bake just so they pull apart easy – this recipe is pretty forgiving you could do it either way. I just pulled them out of the oven. The house smells wonderful. I only made one change; I grated the apples with a large-holed potato grater. I also found it was easier to mix with my hands. A couple questions: What is the finished consistency supposed to be? Chewy? Crispy? Other than freezing, can they be stored at room temperature? I typically soak my brown rice before cooking it, but haven’t tried soaking recipes with brown rice flour (I grind it myself in small batches when needed). I’m thinking throw the brown rice flour in with the oats while soaking, then add the tapioca and other ingredients the next day??? What’s your thought? Yes you can do that Rachel! Hi there! 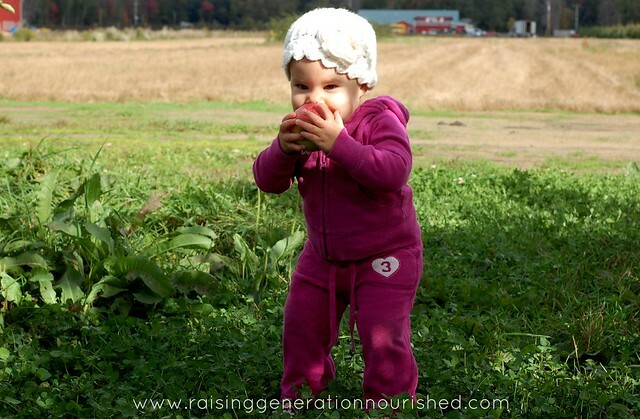 As a bit of relevant background, we are a family living with multiple food allergies and have been eating mostly whole foods for a couple of years now. I gave this recipe a try and found it a tad bland. You don’t call for salt. Was that intentional? Does your family avoid salt? I’m feeling like a bit of sea salt may have made a difference to my own experience. 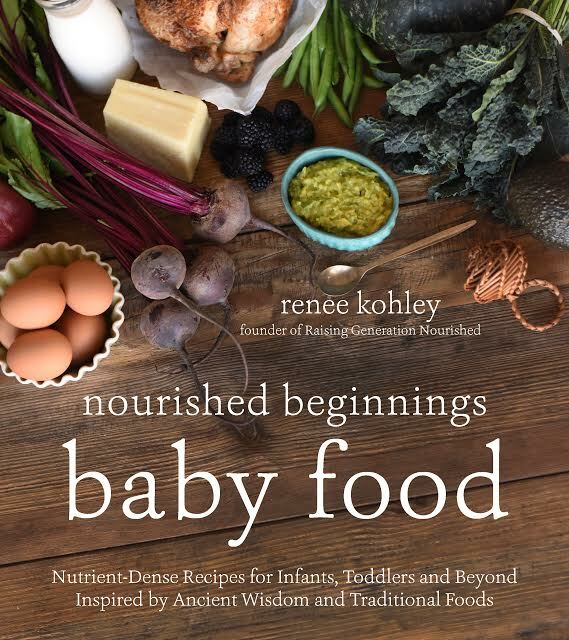 Thanks so much for testing and authoring so many great recipes! Thoughts about adding some collegen peptides to this for some protein? Hi Kim! That should work fine! I haven’t made these in ages, but I think it would definitely work! I love apple flavored breakfast bars. I can smell the wonderful aroma from here. So delicious! Rolled oats, steel cut oats, whole oats, or oat flakes?